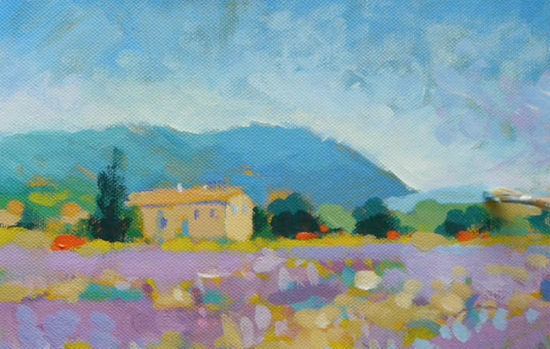 In this Impressionistic landscape series, I am posting a weekly video on my YouTube channel that you can follow along at home. 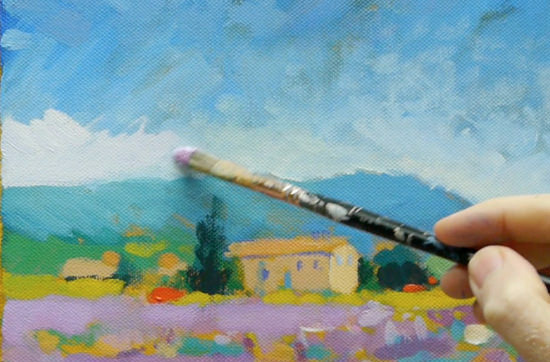 This video below is the final part where we refine the whole painting. Balancing clean blocks of colour with more painterly elements. Often, at this stage of a painting, large quantities of tea are needed! 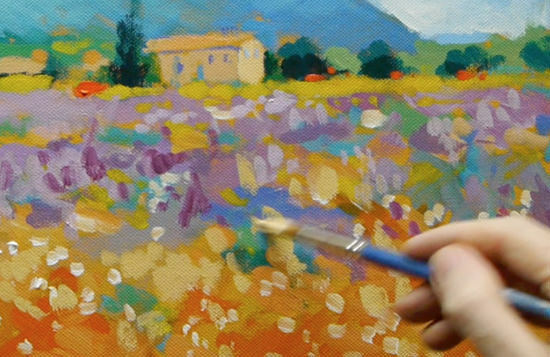 Having a fresh pair of eyes to reassess how your painting is working as a whole is essential. For this painting, I felt there wasn’t a balance between colours, so I mixed a soft peach colour using Cadmium yellow light, a touch of Cadmium red light and white. I move it through in a foreground band towards the bottom of the painting. Having stepped back from the painting I decide to block in the purple colour we first started with. 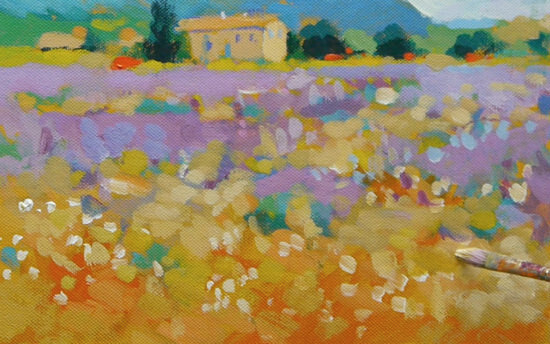 This gives us both a contrast in tone and a nice mix between smaller brush marks and larger blocks of colour. I add a touch of Titanium White to the mix and apply a thick band of paint just below the building. This lighter band helps to separate out the mid-ground and gives a calming area of colour just beneath the focal point – the farmhouse. Using the hog hair brush, I mix Titanium white and the tiniest amount of Cobalt Blue. I then blush in a lighter tone to the top edge of the mountain, to blend the white into the sky I use my finger. It’s important when you’re painting in this style not to get too precious about certain areas of your work. 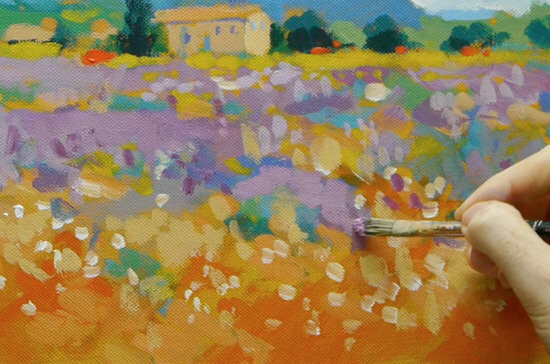 Impressionist style painting is a process of redefining and painting over parts that may have been working well at an earlier stage. 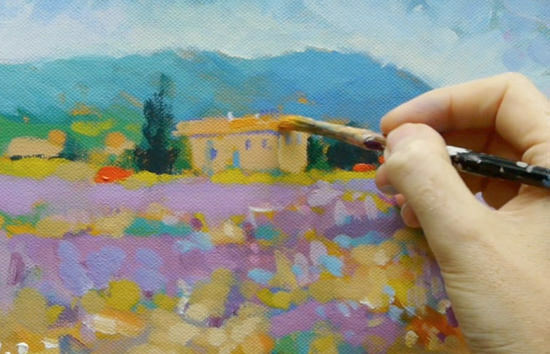 As a beginner, this may seem a bit of a tough blow, but the majority of paintings have many hidden layers to them and parts that have been adjusted for the balance of the final piece. I now add a bit of the purple to the right-hand side of the sky and blend it through with a Cobalt blue and Titanium white to give a subtle effect. Again, the painting started off by using colours from the mountain in the foreground and now this is bringing the mid-ground colour into the sky. I continue to bring this powder blue mix back on top of the purple. It’s a real case of ‘toing and froing’ with a style like this to get the desired effect. I now add a muted yellow that has a slight diagonal line. 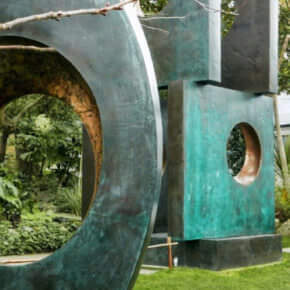 This moves the viewer’s eye around the piece rather than having too many strong horizontal lines, it’s a subtle effect but it really makes a difference. The return of the double-loaded brush! If you notice, on my brush each side has a different colour. I had dipped one side into the lilac mix and then twiddled the brush in my fingers to load up with some of the yellow colour. I can then paint a more broken colour effect very easily without having to go back to the palette. 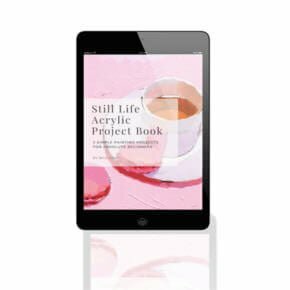 This produces a lovely muted tone with the acrylics, often more associated with Oils, as the colours mix in together ‘wet into wet’. This little mountain got lost in the painting process, so I’m quickly painting him back in and move a few dots of the blue down the piece. Now for the finishing touches, I mix a lovely sunshine orange using Cadmium red light, Cadmium yellow light and white to add a final ‘wow’ factor to thefarmhousee roof – basking in the sunshine! 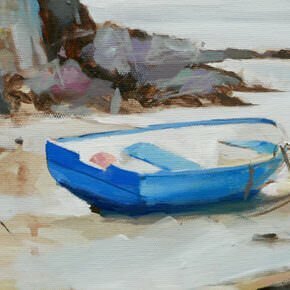 I move this colour with a few brush marks to the foreground of the piece, they are only little marks but are the finishing touches that bring this piece all together. 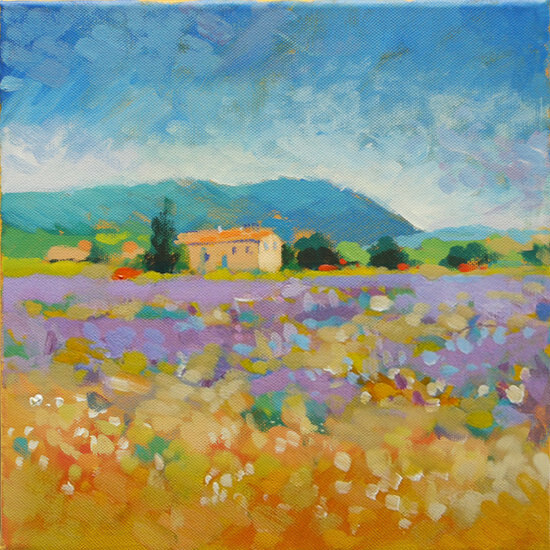 Now all that’s needed is a large glass of wine and imagine you’re in Provence enjoying the landscape! Another great video. I’m planning to try paint and copy one of your videos. I have a suggestion and a request if you may. 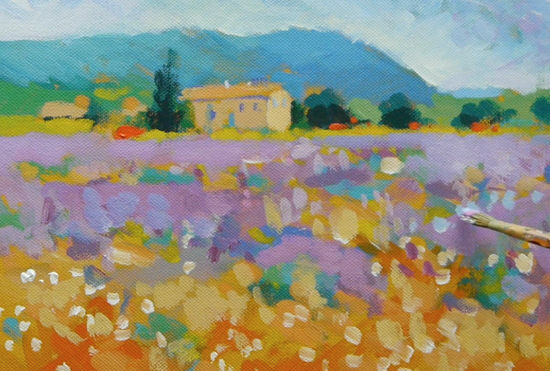 Could you post an article involving terms that are used in art like impressionistic, and bias etc. I hope you could grant my request which I know may help other aspiring artists. Thanks a lot and you become such a great help to me. Thanks for your comment, glad you enjoyed the video. Great idea about a ‘glossary’ of art terms for beginners, I’ll add it to my list of new articles. Do you think it would be possible for me to do this painting and follow your instructions using oil paints of the same colour names? I have all the correct colours in oil. I assume I could still prime the canvas with the acrylic yellow ochre first? Yes, you could try with oil paints with the acrylic yellow ochre coloured ground. The only issue you might run into is the freshness of colour acrylic achieves, so it will probably be a more muted version, but as Monet painted all of his paintings in oils you’ll be in good company! Also, I’m just starting to paint with acrylic paints, and thanks to your advice I bought the beginners limited palette (with added silver and gold paint… :)) and I would be more than interested in having some instructional video on what kind of work you can come up with this limited palette. Too bad that the acrylic paint is quite expensive for someone who has no spare money, I would really love to paint with colours like these and maybe even experiment on my own. Anyways, if you’re taking up some notes on what you could do in the future, I would be more than interested in a series of videos about what you can come up with the limited palette. Watching you work is really fun and educational, I bet it would help me and hopefully many others who are just starting to paint. Really pleased to here you enjoyed the Monet series. You can have a look at the simple jug still life. 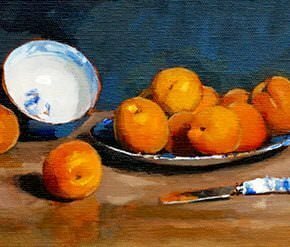 This tutorial just uses Ultramarine blue, Burnt sienna & Titanium white, a perfect limited palette to start with. I really enjoyed this series and even painted this one, my first one. I thought it was good enough to give to my husband for his b’day! It doesn’t look like yours but it does have similarities. I’d love to show it to you. Is there a place I can send you the pic? Your website is the best ever painting website that I have come across. You have such a passion for teaching and sharing your skills. I am amazed at the amount of time you put in it. I have been browsing your website for few weeks now and last weekend I decided to actually do some painting based on your “How to paint like Monet” lesson. I took a couple courses in Acrylic painting last year but I should say I learnt way more from your lesson than those courses. My piece turned out beyond my expectations; thanks to your many tips in the lesson as well as on other lessons/videos your website. Thank you very much for sharing your knowledge with us! 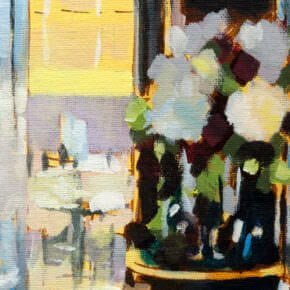 Thanks for your lovely comments, so pleased you have been finding the website helpful and your painting turned out beyond your expectations, that’s fantastic news! I’m so glad i found your website. The best one so far, whatsoever. In the beginning I was hesistating because I can’t draw, so why would I have the potential of becoming a good painter? After a while I thought I might just give it a try and the results aren’t that bad. I’m happy how my first ever painting came out. And I’m definitely gonna practice some more. If I have a bit more money ii’m certainly gonna buy some drawing and painting courses of yours. Again thank you so much :). Greetings from the Netherlands (excuse me if my English is not so good. Great to hear it Daphne, thanks for your kind words. really pleased you’ve been finding the lessons helpful. Geweldig om te horen Daphne, bedankt voor je vriendelijke woorden. echt blij dat je hebt het vinden van de lessen nuttig. like to make a copy of “Maria vestida de labradora Valenciana”. Would you be so kind an share with me what his color palette was and I what are the most importan elements I have to take into consideration at the time to copy his works? I deeply appreciate any guidance you can give me. Hi Tamara, pleased you’ve been enjoying the painting tutorials, you could achieve very similar tones woth the palette I use in the Monet tutorial, but for that particular painting you could create the painting with a palette of a brown such as Burnt umber or raw umber, purple such as cobalt violet, an ultramarine blue and cobalt blue and then a pinky red like rose madder. Using a raw sienna, yellow ochre, cadmium yellow, Naples yellow for the yellows in the background. Greetings from India. This is a great video.I really enjoyed this series and all your tutorials on acrylics. I am more interested in painting in poster/gauche color. 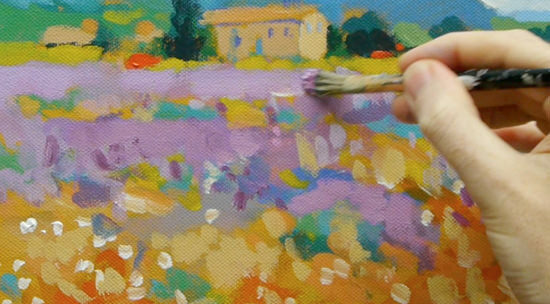 Is it possible to paint impressionism in gauche? If possible than how can I do it? Hi Soham, pleased you enjoyed the lesson, yes you can paint with an impressionistic style with gouache, have a search for ‘Singer Sargent gouache’ to see examples of gouache painting techniques. Thank you for posting these great videos for free! 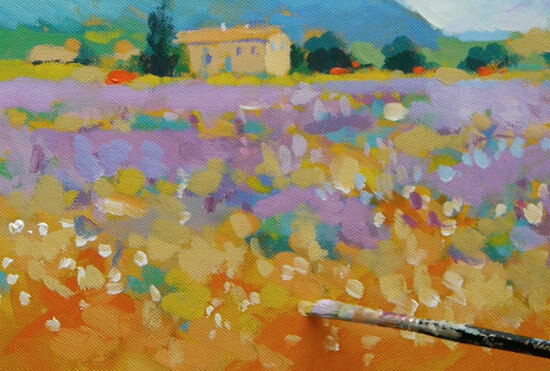 They are so helpful – I love impressionistic paintings but always have a hard time blending the color myself – I end up spending so long on paintings/can never really finish them and everything looks more realistic than I want. I really liked the techniques you used like putting different colors on each side of the brush and bringing colors that you already have mixed for the sky into the foreground. 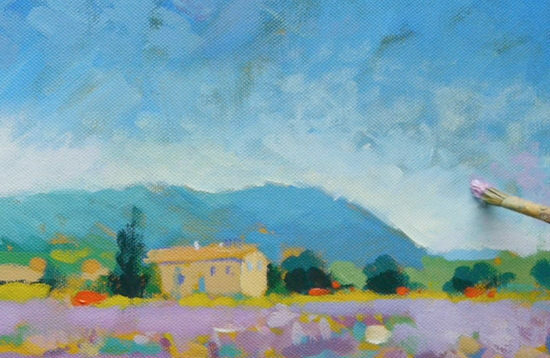 I can’t wait to try some of these techniques – I have been using oils but may try acrylics too. You’re more than welcome, hope you enjoy experimenting with the techniques. Thank you for the wonderfully detailed lessons. I loved the explanations of each technique. You’re welcome Esther, pleased you’ve been enjoying them. I just found your videos ! I having a wonderful time watching you and learning from you. I plan on working on the seascape painting next. Good one Kathy, so pleased you’re enjoying the lessons, good luck with the seascape painting. I find your lessons very helpful. I appreciate the tips you give as you go along in the lesson. I must admit, I cant follow it very well, as you move fast. But I gave it a go. Not a great success, lots of redoing but that too will be done. The important thing is that I am encouraged and I enjoy myself. Thank you so much, Will. I will continue to follow you. Hi Namtip, you’re so right, the important thing is enjoying yourself and learning from your paintings, really pleased you’ve been enjoying the lessons. Pleased you enjoyed the tutorial Barbara. Good one Hanna, pleased you enjoyed the lesson. Good one Veronicka, really pleased you enjoyed the tutorial, hope the groups paintings turn out well. Thank you so much. I really enjoyed this lesson, had a great result and learned a lot along the way. I wish I could post a copy of my rendition. I’m looking forward to completing other lessons on your site. That’s brilliant to hear Jeanne, really pleased you enjoyed the tutorial and you’re happy with your results. Just popped another classic picture thanks to your art school. Not only ending up with a painting that even my wife gives grudging approval, but an insight into Monet’s techniques in his other paintings. Brilliant. Tracked down a natty 10 drawer trolley to keep all my painting clutter tidy. VonHaus sells them on Amazon. £30 delivered to the door. Assembly a doddle. Brilliant one Michael, glad that you’ve been achieving some great results with the tutorials and thanks for the note on the storage. Thank you so much. Five years ago I lost my home and all my art supplies. It was awful! Now, I’m hungry to paint again and try something new. Loved the videos, thank you so much for helping me to relight a warm fire of artistic inspiration. Bless you! So pleased you’ve been enjoying your painting again Kathryn and have been feeling inspired!